Our full body safety harness is the eventual in fall protection, comes the most comfortable, lightest-wearing, truly innovative safety harness. Safety harnesses give comfort and confidence, and directly affects the user’s output, as well as gives them elasticity to do what needs to be done on the job site. Abdullah Anti Fire Corporation Pakistan has the latest range of fall protection solution in Pakistan in the form of full body harness protection. 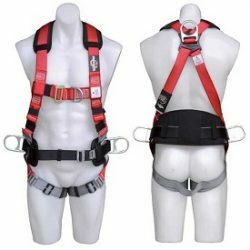 Different brands of Full body harness like Protecta, Honeywell, Exofit Strata, DBI-SALA etc.. have earned a repute as top full body harnesses for maximum comfort, freedom of movement and ease-of-use while working on heights. Featuring the exclusive load distribution system, the safety harness plainly takes the weight off your shoulders and redistributes it down to your hips, significantly reducing shoulder tension and tiredness. Furthermore, its padding delivers sophisticated breath-ability, the quick adapter simplifies connecting and disconnecting of your personal equipment, If your safety harness is weighting you down, Lighten Up with our Full Body Safety Harness. 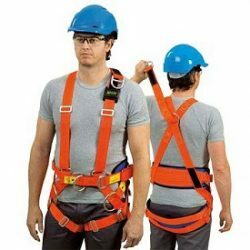 We also deals in innovative safety harness in Pakistan with the spring-loaded, I Positioning, Y Lanyard, safety belt, stand-up back D-ring, No-Tangle pad, and locking quick connect buckles and the torso adjusters in Pakistan. While many of our safety harnesses can be used on most jobs, we also deals in safety harnesses for specific uses within different industries—and you can rest secure all of our industry-leading harnesses meet all relevant standards and regulations. 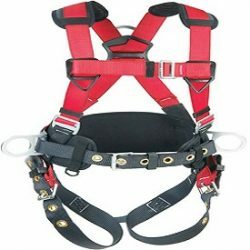 Multi-Purpose full body harnesses characteristically includes extra attachment points such as back and side D-rings which allow work in a variety of situations. The belt and pad on our full body harness provide additional back lumbar support, positioning rings and tool carrying options.